Color cards are awesome (plus a handy tip)! Ok, I love color cards. I collect all of them that I can find. They can be a fantastic tool for picking fabric/thread when you can't actually see things in person or when you decide to start planning a project at 1 in the morning and no shops are open. 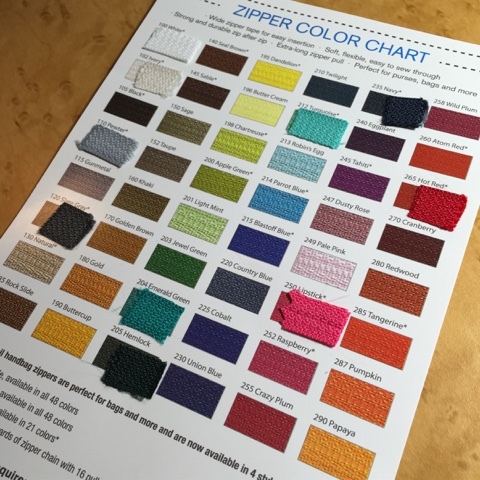 I have to buy almost all of my much loved handbag zippers online (2 stores near me stock a limited quantity of sizes and colors) which can be a little tricky for people like me that are fussy about their colors. Not too long ago, I decided that I would start saving some of the trimmed off bits of zipper tape and make my own color reference card. I used one of the pre-printed color charts that I received in an order from ByAnnie.com and a little piece of double sided tape to stick the zipper tape to the card. It was a piece of cake. It's obviously a work in progress, but I'm going to keep plugging away at it. Anyway, that's it for my quick tip. Now, I have to go chop up some fabric!